Operated during W.W.II by Grace Line, Inc., and War Shipping Administration. 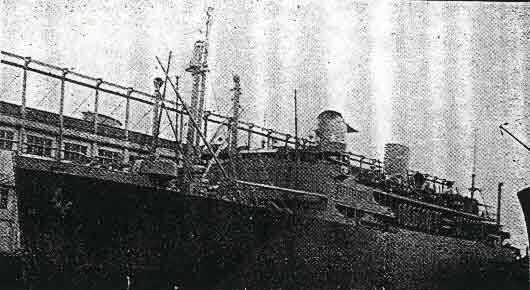 The Santa Rosa was in commercial operation upon entry of the US into the war. She was, however, soon pressed into troop service and made 21 round trips from the east coast of the US to Europe, 1 to Australia, 1 to India, and 3 to Africa during the four calendar years 1942-1945. All departures were from New York except as noted. Voyages of 1942 were: on 23 January from NY, via the Panama Canal, to Melbourne and Noumea; in late April to Suez, Massaua, Aden, and Durban; in early September to the Clyde; on 2 November to Casablanca. Voyages of 1943 were: on 14 January to Casablanca; on 25 February to Bermuda and Casablanca; on 29 April to Casablanca, Gibraltar, the Clyde, Algiers and Phillippeville; on 21 August to Oran in Algeria (this was Dad's trip); on 8 October from Boston to Swansea, the Clyde, Palermo and Newport (England); via Boston on 29 December to Bristol and Newport. Voyages in 1944 were: on February to Belfast; on 24 March from Boston to Avonmouth and Cardiff; on 12 May via Norfolk to Naples and Gibraltar; on 1 July from Norfolk to Oran, Naples and Cape Henry; on 14 October to Marseilles, Oran and Gibraltar; on 2 December from Boston to Swansea, with returns to Boston on 27 December. Voyages in 1945 were: on 3 January to Le Harve and Southampton; on 5 February to Le Harve and Plymouth; on 15 March to The Solent, Le Harve and Southampton; on 2 May to Le Harve and Southampton; on 3 June to Southampton; on 1 July to Le Harve and Cherbourg, with return to Hampton Roads on the 19th; on 25 July to Plymouth and Le Harve; on 28 August the same; on 20 September to Marseilles; on 20 October from NY, via Port Said, to Karachi; on 10 December the same, with return to NY on January 1946. The ship subsequently went to the yard of the Newport News Shipbuilding & Drydock Company for extensive repairs incident to redelivery to the owners. In 1930, the Grace Line decided to greatly expand its service to Latin America, and so built four ships, the Santa Rosa, Santa Paula, Santa Lucia, and Santa Elena. The ships were intended to operate from New York to Seattle by way of the Panama Canal, but this quickly proved to be unsuccessful, and the ships ended up being used to South America and the Caribbean instead. The ships were built in Kearny, NJ by Federal Shipbuilding. The Santa Rosa was completed first, in 1932. Designed by William Francis Gibbs, she bears some resemblance to his later masterpieces, the America and United States. She had some unique features for her day in her 9,135 GRT hull, including a midships dining room that could be opened to the sky. She had a large swimming pool and gym, and all of her first class cabins were outside twins with private bath. All were called to war duty in 1941, and the Santa Lucia (as the USS Leedstown) and the Santa Elena were both destroyed. The Santa Rosa and Santa Paula returned to Grace Line service after a refit in 1946. In 1958, both ships were replaced by slightly larger liners with the same names. They were idled at Hoboken for three years, then sold to Greek interests. They were refit and their accommodation increased, and they were renamed Athinai and Acropolis, departing from Venice on two-week voyages. In 1966 the ships' owners were arrested and the company disbanded after a ferry they owned sank and they were found guilty of negligence. The Santa Paula/Acropolis was broken up in 1972. After sitting idle for over ten years, the much neglected Athinai was used in the filming of Raise the Titanic. She was broken up in 1988. The new Santa Rosa and Santa Paula were built by Newport News, and were 15,350 GRT, 584 feet long and 84 feet wide, accommodating 300 in first class. 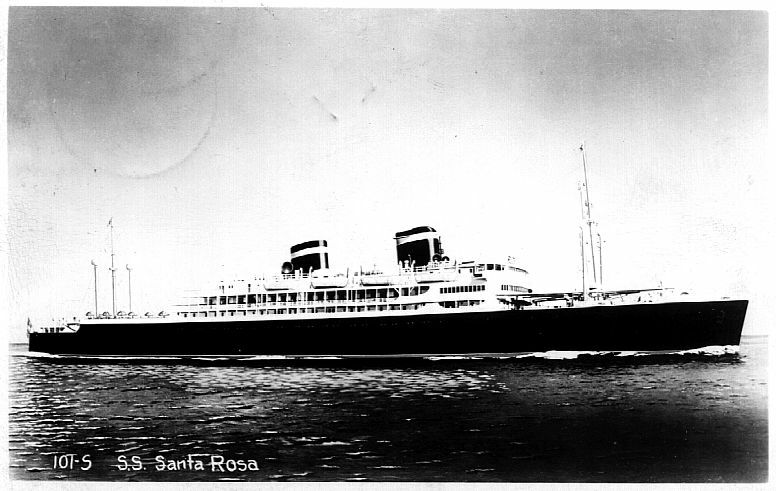 The Santa Rosa was damaged in a collision and significantly rebuilt in 1959. She was laid up from 1971 to 1976, then sold and renamed the Samos Sky. She is now the Emerald owned by Louis Cruise Lines of Cyprus and chartered to Thomson's. The Santa Paula was sold to the Sun Line in 1972, becoming the Stella Polaris. This lasted until 1976, when she was sold again and became the Kuwait Marriott Hotel, opening in 1981. It is unlikely that she is still there.